OLD TOWN — A group of Old Town and Near North neighbors are rallying the community in hopes of turning a shuttered Chicago Public Schools high school into what they say is a much-needed park. Most of the windows of the brick Near North Career Metro High School — across the street from million dollar homes and half-million dollar condos — are boarded up and some are sprayed with graffiti. The former school, 1450 N. Larrabee St., was closed 12 years ago and covers about 11 acres of property near the former Cabrini-Green public housing complex. There's an adjoining one-block by one-block field with a track and baseball diamond, but it is fenced off to the public and used by Jones College Prep. 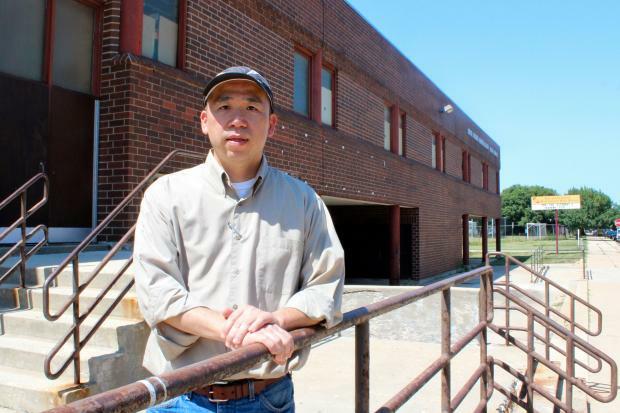 "Even the community that used to be able to use it can't use it anymore," said Don Lee, who has lived across the street from the school for 15 years. "It's this nice beautiful space that's really in demand, but we just can't get the attention." Lee said the access-blocking fence around the field went up about four years ago. An official CPS sign hangs on the fence stating "No public use during school and athletic event hours," but the gated entrance is locked when the fields are not in use. "A lot of people have pets and kids, but usually will play in this small little patch of land between the school and the [fenced-in] park," said Paul Gaudette, land use and development chair for the Near North Unity Program. Other families play in the alleys behind their homes, according to residents. The school building, which once housed more than 900 students, is currently used by the Chicago Police and Fire Departments for training. The area around the former school is developing quickly and residents behind the park petition fear the school site could be the last space available. "It's not just about the kids," Lee said. "It's about the family unit. It's about meeting your neighbors, creating a community bond." Lee and fellow neighbors behind the petition point to a city planning document that recommends 2 acres of green space for every 1,000 residents. Currently, the area in question has 17 acres of green space, well below the recommended minimum of 45 acres. Those numbers don't count the hundreds of residents who will move into residential developments planned for the neighborhood. "You can imagine how many people are going to be here and there's no open park," Lee said. As of last week, the petition had gained more than 1,200 signatures online and hundreds more in person. The land and school were owned by Chicago Public Schools until May of 2012, when they were handed over to the city in a land swap deal with CPS that gave the school district $115 million in Tax Increment Funding for the new Jones College Preparatory High. A spokeswoman for the Chicago Housing Authority, which controls the property, said no final decision has been made on how the land will be developed, and said the housing authority is considering "a variety of potential land uses." The land falls under the Cabrini Consent Decree, which requires the city to construct 700 public housing units and 296 affordable units in the area where the towers once stood. A timeline for redevelopment of the former school site has yet to be determined, according to Wendy Parks, the CHA's director of communications. Lee and Gaudette both criticized the city for an overall lack of communication with the neighborhood about the site. "It's so important to the neighborhood. Otherwise, we just become so dense and you just run out of space when the development is done," Gaudette said. Lee, Gaudette and their team of about a dozen neighborhood residents who are part of their team want the space to include expanded baseball fields, a running track, children's playgrounds, a dog park, a city farm and most importantly open space with trees paths and benches. Gaudette grew up in Beverly, where parks were a rallying point for the community. He sees the opportunity to create a large park in a dense area as following in Chicago's tradition of parks dating back to the 1909 Daniel Burnham plan for the city. Parks, he said, "get people out of their house and into a common area," describing the green spaces as "the heart of any community." The makeshift team of long-time neighbors which has come together to push for the park had never met each other until about 6 months ago. Now, they are throwing in $50 or $100 each to hire an illustrator who can draw up what they envision for the park. They hope to garner enough signatures and present their package of ideas to Ald. Walter Burnett (27th). "Our hope is for him to champion it," Gaudette said.